With attention to detail for the perfect look of your railway system. 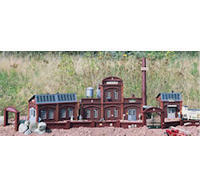 The PIKO buildings for G-scale and 1-scale (scale 1?!) systems are weathered to look as realistic as possible. The design and all the engravings are made with a high attention to detail to make sure that in the end model railroaders receive an excellent and well-fitting building model kit. Our service for you: layout, assembled dimensions and construction manuals can be downloaded (PDF) for free on the subpages of the respective products.